1. 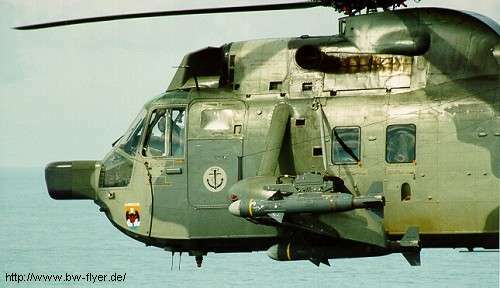 Revell have issued their 1:72 Sea King Mk.41 with Skua Missiles, #4411. 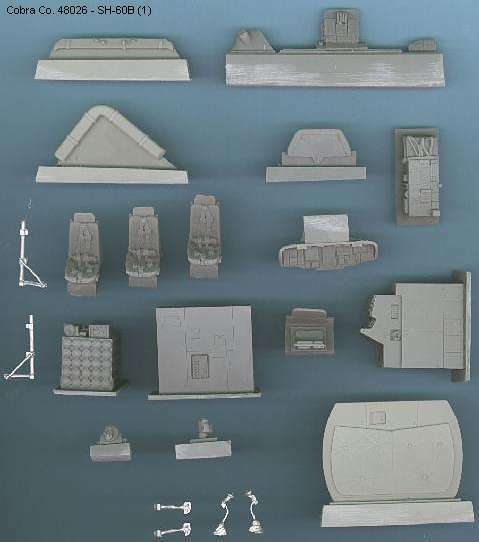 This is of course based on their 1998 Mk.41, you get all the sprues from this, plus a new one which has parts for four Sea Skua missiles and their pylons. 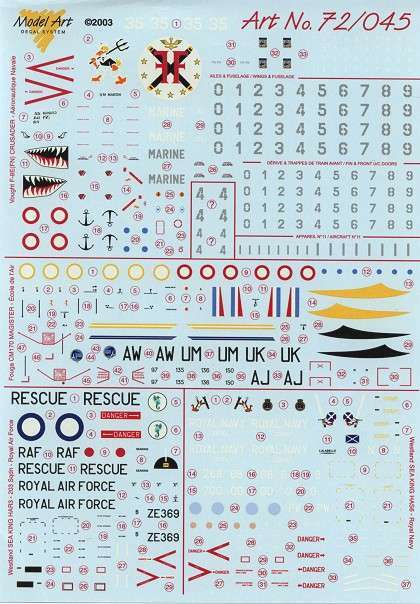 As an extra bonus you also get a sprue from the HAS.6/AEW.2 kit #4450; the only parts used (as an option) from this make up the sand filter box, so your spares department will gain a flat-topped MEL Sea Searcher radome, a six-bladed tail rotor, a MAD sponson, RWR sensors, fuselage strake, and a selection of other useful bits and pieces. 89+50 in a new all-over grey scheme which we are told is being trialled during an ongoing deployment to Djibouti (June 2003). 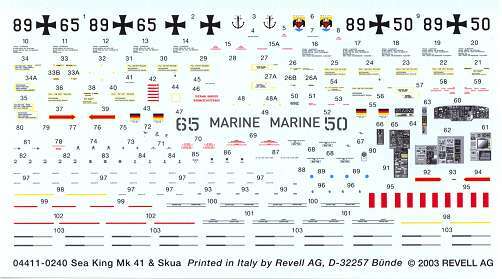 The decal sheet is as usual in new Revell releases, seriously impressive. The recommended paint mixtures are as usual farcical, compounded by the fact that in some cases they specify mixtures of paints to make RAL colours which they already sell in single pots. What will it take to persuade Revell to abandon this ridiculous and deceitful policy which undermines their otherwise excellent products? Looking more like a gallows sitting in a wading pool than an aircraft, the Hiller VZ-1 was actually a VTOL flying platform, devaloped on the 1950s for the U.S. office of Naval research. Two prototypes were built before the project was 'retired' in 1959. 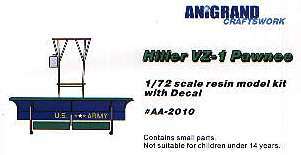 The Anigrand kit is minuscule (considering the actual aircraft only had a 5' diameter platform....) and consists of just 21 parts, plus a small decal sheet with U.S. Army markings. An interesting subject for VTOL modellers but the addition of a 1/72 scale figure, to stand on the platform would have given the built model a proper size perspective. 4. HKN has heard that Miku / Legato are seriously considering another Cheyenne, this time in 1:48 scale. 5. Revell's celebration of the 100th anniversary of ADAC will consist of three 1:32 kits, the Bo-105, BK-117, and EC135, all of which are currently serving in the ADAC Fleet. Set #4441 is scheduled for release early in September. 6. 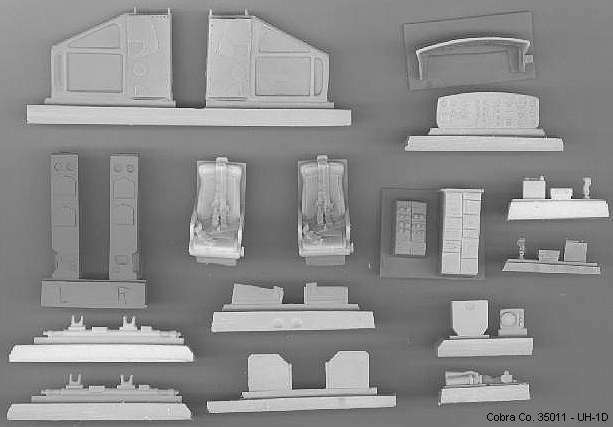 Cobra Company detail set #35011 for the Panda 1:35 UH-1D is shipping today. This is the first of several sets for the Panda Hueys (UH-1V and UH-1H conversions will follow). It includes opened doors with inside detail, two corrected and detailed pilot seats with armor panels, instrument panel and glareshield, overhead console and centre pedestal, map case, interior support structures, seat support tubes, intercom controls and lighting panel for the rear cabin, cyclic grips, inertia reels and a fire extinguisher. Interior details: full cockpit detail, two seats and white metal frames (optional), white metal flight controls, master avionics control box, environmental control piping, ASW operators console and seat and white metal frame, RAST winch and fully detailed Sonobuoy Launcher. The Launcher also has a clear vac-form cover and an etch metal "spider" shown in the other photos. The pilot seats fit without using the white metal frames, they are an option. The environmental piping will require minor trimming as will the rear of the Sonobouy launcher. There is also a detailed rear cabin wall which will require minor trimming. 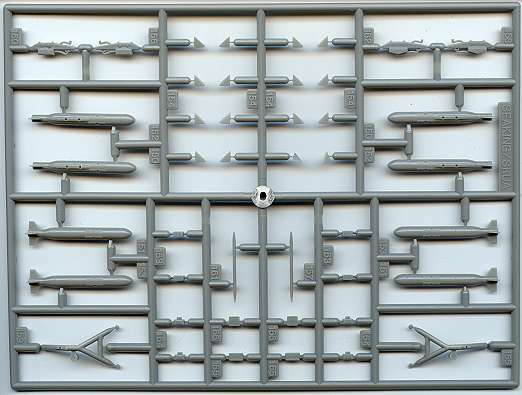 These are some of the exterior parts: detailed pilot doors with vac-form windows, optional rear cabin door, resin wheels of proper proportion and size, tail bumper and lamp, flotation bag extensions, chaff and flare dispensers, modern pylons for mounting weapons and fuel tanks and MAD unit, fuselage sensors in correct configuration and the underside IR jammer which the Italeri kit is lacking. There will also be the small "lump" antenna that is missing from the underside of the tailboom. The flotation bag extensions for the landing sponson will require some work to the kit pieces as they are undersized. The pilot doors will require minor trimming at the top and bottom for correct proportioning to the Italeri kit door frames. This final shot shows the remaining parts for the exterior and the etch metal sheet. Three fuel tanks with etch metal fins, two torpedoes with etch metal fins and props, two para-retarders for torpedoes, MAD unit, optional white metal landing gear sections, the flotation bag clearance rails, full white metal Naval rotor head and the etch metal sheet. The landing gear are optional but the tail wheel section is much more robust than the kit one. The etch metal sheet contains plenty of little things like tie down rings, landing gear scissors, rails for the sensor operator table, external latches, antennae and optional external Sonobuoy details. The Sonobuoy detail on the kit is three dimensional and has two open ports. It is very slightly oversize but acceptable. The photo-etch items are two dimensional and include a cover plate for optional use. In the future there will be #48032, HH-60H conversion and #48033 HH-60J USCG Jayhawk conversion (including decals). 7. Here is Eduard's September list; last month we had three etched metal sets for the 1:35 Kangnam/ARII/IMEX/Academy AH-64A Apache. This month it's the turn of the 1:35 AH-64D Longbow from the same source. 32110 AH-64D Longbow Armament, three sheets, fins for 8 Hellfires, detail for pylons, 18-shot rocket pods, and gun. XS228 Agusta A109K wheel & canopy masks, for the 1:72 Revell (this is labelled "A-129 Agusta", but I guess this is what they mean). 8. In September, IsraDecal will be issuing two new sets of helicopters decals. The first is 1:48, #IAF-23, and will cover all AH-1S Cobras, MD500 Defenders, AH-64 Apaches, H-65 Dolphins and Panthers, and H-60 Blackhawks in IDF/AF service. All the new tail arts that have been added during the last two years are included. 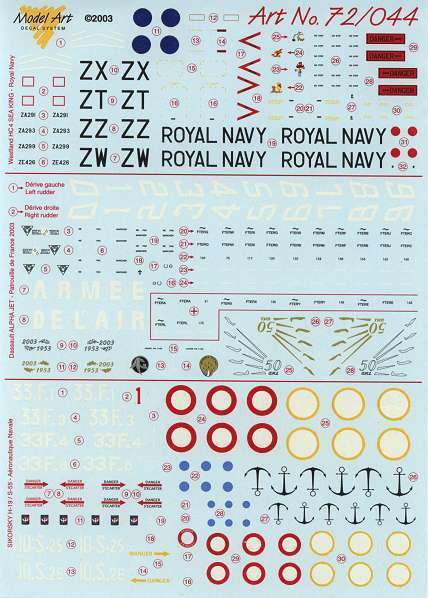 The Blackhawk section will include ALL the English stencils for the helicopter, these are also applicable to any non-Israeli Blackhawk, as well as providing markings to build any type of Blackhawk in Israeli service. The Dolphin and Panther decals will fit the Trumpeter kits. The instruction booklet will feature 16 pages of drawings, text and photos. 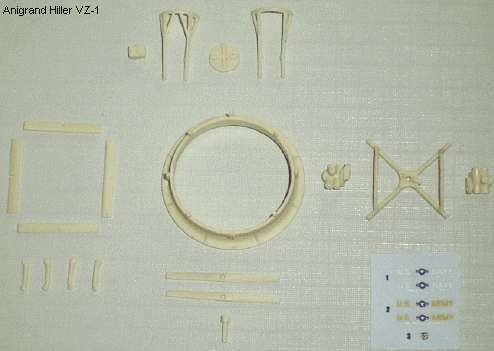 The second set is for the IDF/AF Blackhawk in 1:35 scale, for the Academy kit, and like the 1:48 set also gives all the stencils for this helicopter. 9. 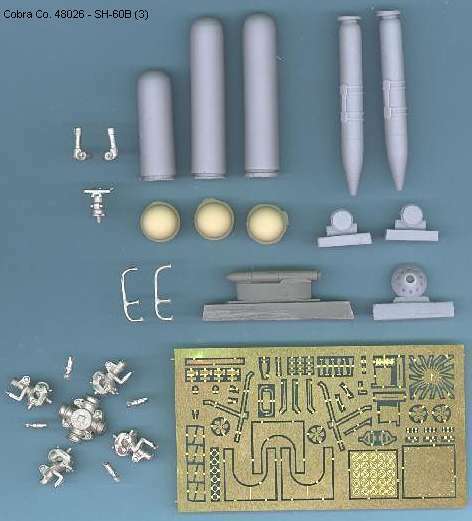 Coming soon from Ciro is an Mi-17 weapons set, #C-016, in 1:72 scale. 10. 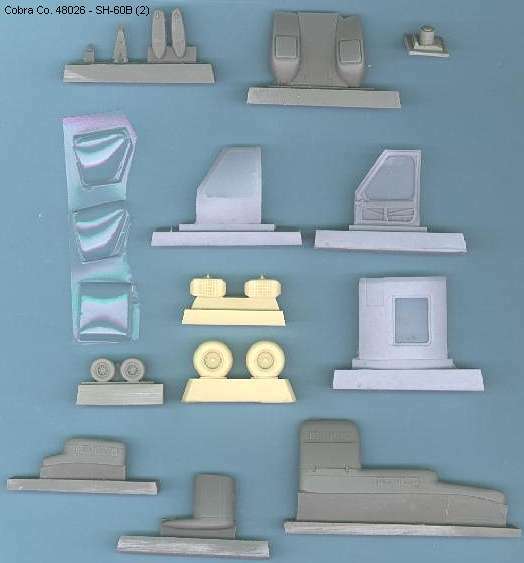 From Flightpath we have soon have two diorama accessory sets, both in 1:72, the first is a USN Carrier Deck Diorama Set, while the second is an Airshow Set.